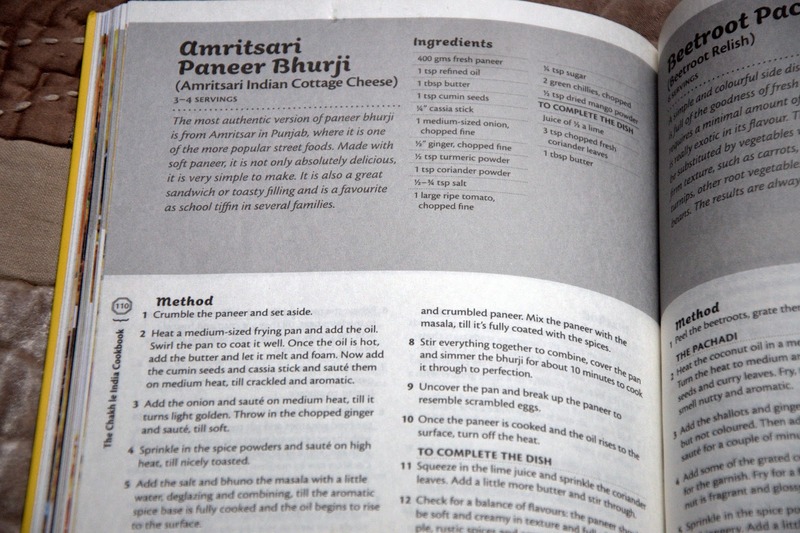 I posted a recipe of Amritsari Paneer bhurji from the book Chak le India written by Aditya bal some time back. And I promised to share my experience of meeting the author in person. But first a few things about the book. Even after being apprehensive about a book by a TV show host initially, I liked the book by it's old times feel. I have a few old cookbooks printed on cheap paper, no photographs and still with very good recipes written very accurately. I don't mind a casual language in a book as long as the content is great. I started reading the list of recipes and was almost impressed by the names on it. The list of recipes boasts a wide range from almost all states of India and I liked that. Since I wanted to try a recipe for the book before I met Aditya, I chose the simplest recipe in the book, also because it was a little different from the way I make my Paneer bhurji. The experience is shared well before. This is not a book to follow recipes to the T.
No good looks, not written or edited well, no recipes worth following. Not even an index to help a poor reader.That's all I have to say about the book. The paneer bhurji was salvaged by an experienced Indian cook who knew her paneer and the bhurji well. A new cook would be put off cooking for life trying such recipes. Then we all at Chef at Large bloggers table met at Veda to have a chat with the author himself. He came across as a nice, grounded person who talks honestly. Actually he won a difficult admirer that day. I would admire him for being so forthright about how he came into being a food show host and then a cookbook author. He shared his stories of failures with us nonchalantly and admitted that the book was written in an haste and the publishers were not in constructive communication with him while deciding on the layout and other content. I could see how celebrities are made and then taken for a ride by the market forces, the actual person behind it fades in the oblivion more often than not. You can see Aditya explaining about the book to me. Initially he said the recipes are open to be experimented upon and you can all make changes according to your taste. I said I would like to try your rendition of a dish first and then may be would do a change the second time if I have to. Like he is doing a show called Kachha Rasta currently and a book is on the way for that show as well. I told him I would like to have a taste of that particular part of India as you had it when I try your recipe. He got my point apparently. So a recipe should be able to translate the same taste to me when I try. I am looking forward to the Kachha Rasta cookbook to see whether there is an improvement on that front. 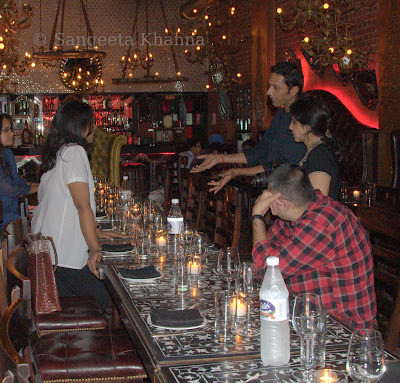 This event was held at Veda, a place designed and owned by Aditya's uncle and the famous designer Rohit Bal. The interiors theme is Goth Vampire, something we were so looking forward to, but goth is done to death here. Thankfully, I liked the black and white inlay work tables and could keep my eyes either on the table or my friends around. Without such friends, I wouldn't survive such a place for more than 5 minutes. And yes, I have to say a few things about the food as well. 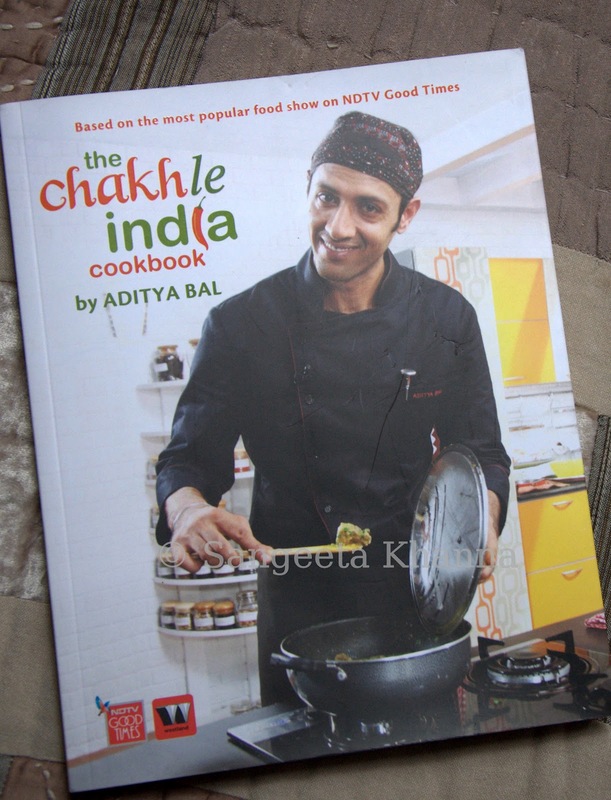 Although the event was to enable us to interact with Aditya Bal, the author of this cookbook, the place was a famous (?) fine dining place owned by a famous designer, we were all expecting good food. I remember only two things I ate that day. 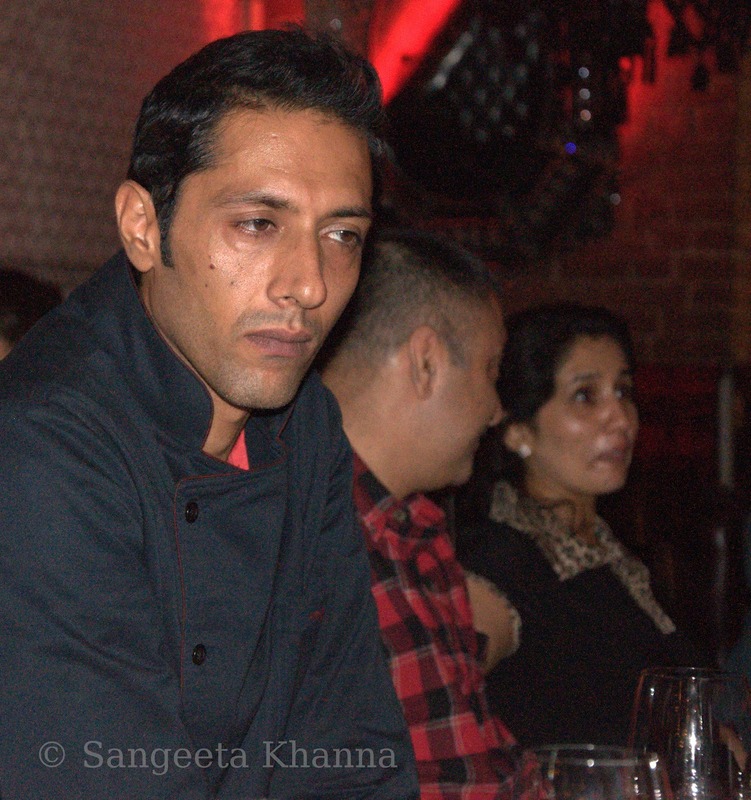 The very first thing that was served was a palak patta papdi chaat and that was really good, raised our expectation. Whatever came after that was plonked into our plates hastily one after the other and was very much forgettable. The second thing I remember is the Mutton Rara passed on as Veda special mutton (pronounced by the server as Vedaespessal mutton), that was nice, not special in any way. Parul described it very well as Shadi ka khana where you eat animatedly greeting relatives and friends and the food is just something you have to have. Some dhabas serve the same kind of food tasting much much better, no point wasting your time in a hideously done up place with horrid lighting camouflaged as fine dining. There were a few more irritants at Veda. This representative of the publisher, who greeted us there, was being quite intrusive in asking for doing a review of the place, the decor, the food and even the wines served saying it was all sponsored (by whom?). Isn't that like taking the bloggers for granted? Calling them for one event and pushing a few more products at them and asking for more? Horrible. You must know bloggers work hard to make their niche and wouldn't want to look like commercial billboards. Aah..after a long rant I am so glad to tell you the evening ended on a very happy note. Especially for me. The next day being my birthday, Deeba and Sid planned a cake for me and we all celebrated there. I love such people around me, even for a millisecond. See how gorgeous was the cake. Go take a look at Deeba's post where she shared this cake in all it's glory. Thank you Deeba for this and much more. You said it ALL sangeeta! ROFL... what an experience. Done to death, , but thankfully Aditya was a good guy! Can't wait for another cookbook to land on our table. The cake was a pleasure to bake. Heres to us!!! I watch Kaccha rasta too, and more than what is cooked, I like the places and the people with whom he does so :) Such a homely feel to it! Hi. I enjoyed your Critique of the Chakh le India Cook book. Funnily enough, i also tried the Amritsari Paneer Bhurji - and I thought it was delicious: full of flavour and different from the usual paneer bhurji. What can i say? Taste is subjective. The Dhabe ka Keema is also yummy. I agree that the printing and pics are of very poor quality, and I am sure they could have done a better job. Yes there is no index and so I checked out books by some prominent authors (Sanjeev Kapoor's "Dal and Kadhi" and "100 Great Indian Recipes" compiled by Masterchiefs of India) and those books have NO INDICES too). I love all Aditya Bal's cooking shows and his passion shines through. I am always amazed how the very simplest of food in the humblest of homes is made to seem so exotic. That is respect for food. I am not a critic or blogger but I would recommend this book for its simple and easy to follow recipes; for the detailed instructions; for the guidance as to how a dish should look and; for the tasty dishes.It also brings to us food from various parts of our Country and there is a broad spectrum of tastes and flavours. 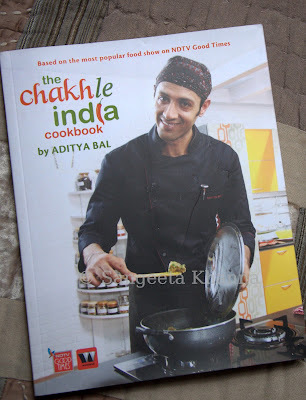 As he says in the Introduction, Aditya has presented recipes collected from various places he visited while presenting the TV Show "Chakh Le India" with his variations - "The recipes in this book are not set in stone, so they can be improvised...etc"
Someone has compared this book to Highway on my Plate. That is a good book too, but it is not a cook book and a comparison is out of place. From the comments of your group it seems your evening was spoiled because you did not like Veda and the food there. I would wish the novice author all the best and hope he goes on to write many more and better books. Thank you Buzzworld for taking out time to read this and writing a detailed comment as well. I think you missed what I wrote for Aditya, I mentioned that he won a difficult admirer that day, I liked him as a person, as an enthusiastic and passionate cook. I wrote that he admitted his communication with the publishing house was not very good while the book was in print, that explains all. am not questioning his capability, but the book bears his name and he needs to be careful in future. And about the Amritsari Paneer bhurji my friend, Did you cook for 10 minutes as suggested in the recipe in the later stage? Without adding any water to it? What the humble paneer that has been seasoned, cooked for a while without any water would do when you cook it for 10 long minutes? It would get charred t the base. A great recipe can be spoiled by erratic instructions, and that makes a recipe a recipe. I know he cooks really good food, just a little effort towards writing them correctly is required. believe me, I have learned it the hard way. Critical feedback makes me grow as a food blogger, writer and as a person too.